As we all prepare for the newest travel ban, we have to remember that our real fight is against Islamophobia. What can the last Executive Order teach us? The hastily imposed “Muslim ban” barring travel from seven predominantly Muslim countries in late January caused global chaos, confusion, and frustration, despite the Trump administration’s spin that the original Executive Order was simply an “inconvenience” to 109 people. Inspired in part by the Women’s Marches from the previous weekend, liberals and progressives around the world mounted large demonstrations at airports and courthouses across the country. Though an embrace of the myth of “America” as a “nation of immigrants” pervaded the demonstrations, erasing both the history of U.S. settler colonialism and the continued existence of Indigenous Peoples, the airport protests illustrated the capacity of these groups to mobilize quickly, effectively, and in large numbers. As we all tuned in with rapt attention to the stories of individuals attempting to traverse the U.S. border, it quickly became apparent that many more lives were disrupted by the ban than the administration acknowledged. In fact, in direct contrast to the their claims, on February 3rd the State Department documented closer to 60,000 directly affected visas. News stories shifted from the detention of Iraqi interpreters who had worked for the U.S. government, to the denial of entry to refugee families from Syria, and children being kept from their parents. Anecdotal evidence quickly made it clear that the EO’s impact was far broader than the seven countries it listed: Fadwa Alaoui, a Moroccan-born Canadian citizen, was deemed “inadmissible” because Customs and Border Protection found Muslim prayers on her phone. The day before the ban was stayed, Hina Shamsi, an ACLU lawyer returning from Puerto Rico, was stopped and questioned, presumably in part because of her work. Reports also circulated that immigration officials had been “stopping and even banning valid visa holders from returning to the country weeks before the official directive,” effectively preventing forty students, and most likely many more, from beginning or returning to their studies in the U.S. Importantly, many of these students weren’t from the seven countries included in the EO, demonstrating the expansive reach of such laws as they are actually administered. For instance, the week after the travel ban was announced, one of my students, an international student from Japan, told the story of her friend from Maldives who had recently had his visa for graduate study rejected, he believed, because of his Muslim faith. These cases suggest that while the original ban and the new one Trump signed today are egregious violations of the stated principles and the letter of U.S. immigration law, their existence and their expansive application might more accurately be understood as routine rather than anomalous. For people who have been watching the actual workings of US immigration law over the last few decades, or experienced its power first hand, these “anomalies” are, in effect, how the administration of immigration law works. Unlike criminal and civil law, immigration law functions primarily through its application in U.S. consular offices abroad, at border crossings, including airports, and in United States Citizenship and Immigration Services (USCIS) offices within the territorial U.S. As debates about the “Muslim ban” make clear, immigration law has one other vitally important distinction from other types of law: the individuals it impacts most are not guaranteed the rights of citizens or even the scant rights guaranteed to people by the constitution. Because of this, the practice of administering such laws is not restricted by even nominal notions of equity and fairness and is instead shaped by the subjective determination of suspicion and risk made by individual border to Transportation Security Administration (TSA) officials. As an ACLU report from February 2017 demonstrates, the government’s “behavior detection” program, used by TSA agents across the country to flag individuals for inspection and questioning, is unscientific and administratively institutionalizes Islamophobia. Similar practices were in place during Chinese Exclusion from the 1880s to the 1940s, when international students, along with merchants and ministers, were still allowed to enter the United States as exceptions to the restrictive law. Despite this exception, Chinese students were treated as suspects and criminals in their interactions with immigration officials, frequently harassed and denied admission. More targeted tracking of international students began with the 1952 Immigration and Naturalization Act, which codified the “F” student visa and gave the Attorney General the authority to “prescribe special regulations and forms for the registration, fingerprinting, and photographing” upon arrival in the United States. That the Trump administration turned to this very law in making the case for the ban illustrates the continuities between these two moments. In the 1960s and 1970s there was a direct correlation between the growth of a non-white, or at least not-quite-American-white, and particularly Middle Eastern student body and the increased regulation of international students. Palestinian scholar Edward Said identifies this as an era of the “unrestrained and immediate” appearance of an image of people from the Middle East and people who practice Islam as “[r]obed Arabs, fantastically monied and well armed.” U.S. support for Israel in the 1967 war with Egypt, and subsequent campaigns by domestic Zionist organizations that warned of Palestinian organizing in the U.S., were early contributors to the appearance of this image, despite the ways in which the Arab-American community was, at the time, largely assimilated into American society. In 1969, President Richard Nixon attempted to start a program to monitor Arabs and Arab-Americans in the U.S., with a focus on international students, largely in response to claims by Zionist lobbying groups that Arabs were organizing on campuses and making connections to the Black Panther Party and Students for a Democratic Society. Events at the Munich Olympics in 1972 provided the eventual catalyst to implement his plan. According to Elaine Hagopian, a founding member of Arab American University Graduates who went on to become a professor of sociology, these events led the Nixon administration to issue a secret initiative, “Operation Boulder,” authorizing the widespread surveillance of Arab American students, specifically Palestinians. Though this initiative ended in 1975 after the State Department deemed it not “cost effective,” it set a precedent for the targeted surveillance of Arab and Muslim students. The first real success at implementing a tracking system for international students passed Congress in 1996, legitimated in large part by the alleged participation of a Jordanian international student on the 1993 World Trade Center attack. While this effort floundered in the late 1990s, the events of September 11, 2001 dramatically shifted the landscape of U.S. security. After it was reported that three individuals involved in the attack were in the U.S. on student visas, California’s Democratic senator, Dianne Feinstein proposed a six-month moratorium on all international student visas. In making this proposal, Feinstein echoed claims made by the Center for Immigration Studies (CIS), which a 2009 report from the Southern Poverty Law Center describes as an anti-immigration nativist organization. 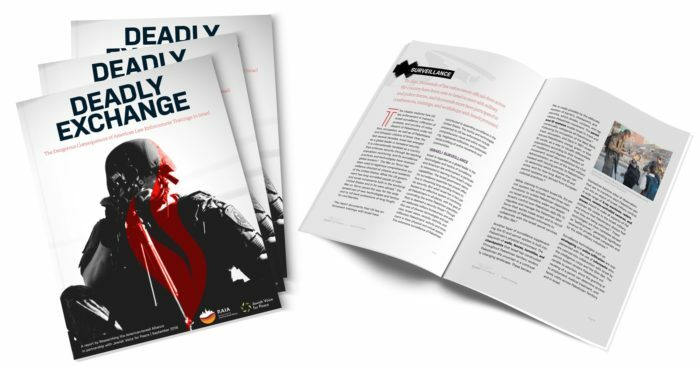 While the moratorium never went into effect, it contributed to an atmosphere that made possible the inclusion of The Student and Exchange Visitor Information System (SEVIS) in the whirlwind process of the USA PATRIOT Act. Yet, as Diana Jean Schemo observed in The New York Times after SEVIS was implemented in February of 2003, “the system is as much an effort to reassure a skittish public as it is to catch warning signs.” Under SEVIS, schools are required to supply the federal government with information on international students, effectively turning student advisors into government watchdogs. Students are now required, with very few exceptions, to navigate an interview with a U.S. consulate before being granted a visa, though only after paying to enroll in SEVIS, which is currently $160. In these interviews students must demonstrate their love, respect, and desire for the United States and a U.S. education, while simultaneously convincing the consulate that they will not overstay their visa. Both the fee and the requirement for an in person interview create particular difficulties for students in the Palestinian territories since visiting the U.S. consulate in Jerusalem requires navigating Israeli security check points. As we begin to unravel the implications of the new Executive Order there is much to learn from the last month. First, the initial EO made it clear that the administration plans to draw their immigration policy almost directly from CIS. This is apparent in the use of the language of extreme vetting, which Krikorian has advocated for over the years in his support for “ideological screening” and in Stephen Miller’s resoundingly criticized use of CIS research to claim that seventy-two people from banned countries had been implicated in “terrorist activities.” Secondly, we have to take the students themselves seriously, not simply because they criticize the travel ban, but because they link their experiences of U.S. immigration processes with broader U.S. politics of race, religion, labor and higher education. For instance, in her comments to Democracy Now, Elamin drew out the relationship between the Muslim ban and the criminalization of black people, immigrants and Muslims, arguing, forcefully and correctly, that critics of the ban must be vigilant in their attention to these connections. Meanwhile in her comments to Democracy Now, Rafiee was careful to show her appreciation to her union, the Professional Staff Congress (PSC), for their support while also pointing out the fact that many private universities in New York have fought against ensuring their students similar forms of support. As elite universities including Harvard, Brown, Yale and Northwestern file amicus briefs in cases against the ban, statements from these students help remind us of the broader political environment international and domestic students face on campus in the United States. This includes the incredible degree of repression and at times even state-sanctioned surveillance faced by Muslim students and students organizing in support of Palestine on U.S. campuses. We must keep in mind that the Trump administration is enacting the latest stage in a much longer history of surveillance and violence against Arab and Muslim people traveling to and living in the United States. Any fight against these actions can only be successful when we understand these policies as the manifestation of deeply ingrained racism and Islamophobia. 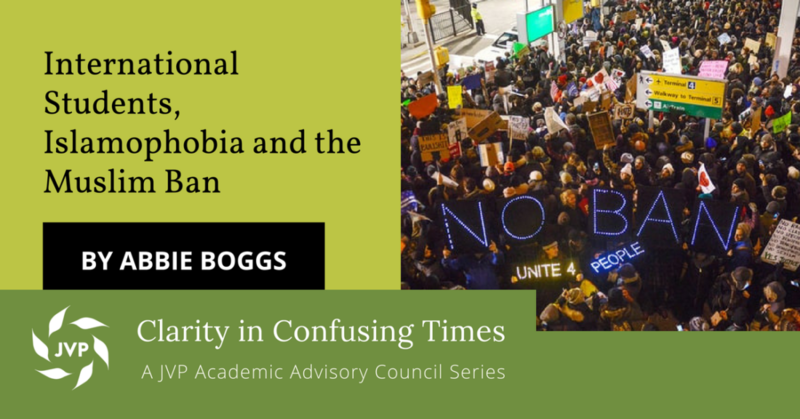 Abbie Boggs is an Assistant Professor of Sociology at Wesleyan University.